An arthritis drug should have been taken off the market years before it was finally withdrawn, say researchers. Manufacturer Merck withdrew Vioxx in September after evidence linking it to heart problems. Bur an analysis by the University of Berne in Switzerland found serious question marks over the safety of the drug dating back to 2000. The research, which suggest patients were needlessly put at risk, is published in The Lancet. The licensing of Vioxx and its continued use in the face of unambiguous evidence of harm have been public health catastrophes. The Swiss team pooled the results of almost 30 studies comparing the effects of Vioxx and either dummy pills or other anti-inflammatory drugs. By the end of 2000, 52 patients out of 20,742 taking part in the studies had suffered a heart attack. 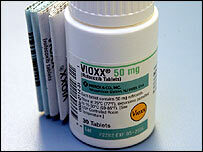 Patients on Vioxx were more than twice as likely to have heart attacks as those not taking it. At the time the drug - known medically as rofecoxib - was withdrawn it was being prescribed for an estimated 400,000 in the UK. Writing in The Lancet, the researchers, led by Peter Juni, said: "Our findings indicate that rofecoxib should have been withdrawn several years earlier. "The reasons why manufacturer and drug licensing authorities did not continuously monitor and summarise the accumulating evidence need to be clarified." The researchers said the safety of Vioxx had been questioned since the publication in 2000 of results from a trial comparing it with the anti-inflammatory drug naproxen. The findings revealed a five-fold higher incidence of heart attacks in patients taking Vioxx. But this was attributed to the fact that naproxen has a protective effect on the heart. Mr Juni's team found that the protective effects of naproxen were small and could not alone have accounted for it being so much safer than Vioxx. In a commentary piece, Dr Horton said: "The licensing of Vioxx and its continued use in the face of unambiguous evidence of harm have been public health catastrophes." Dr Horton said Merck had been badly damaged by the episode, and public trust in the pharmaceutical industry had been eroded. He also rounded on the US regulator, the Food and Drug Administration for ignoring evidence that Vioxx was not safe. He concluded: "With Vioxx, Merck and the FDA acted out of ruthless, short-sighted and irresponsible self-interest." In a statement, Merck said it had acted responsibly and appropriately in the way it developed and marketed Vioxx. The drug had been tested in well controlled trials, and the data had been published in major medical journals. When safety concerns arose the company investigated the issues diligently, the statement said, and when, for the first time, research confirmed a risk of heart problems the drug was withdrawn within a week. In went on: "Merck was vigilant in monitoring and disclosing the cardiovascular safety of Vioxx and we absolutely disagree with any implication to the contrary. "Moreover, Merck disagrees that the data from the meta-analysis published in The Lancet indicate that Vioxx should have been withdrawn from the market several years earlier."